My wife begrudgingly rolled over when the alarm went off at the hotel. We were to meet our guide, Captain Matt Miles, at the boat ramp for a smallmouth float on the James River in about an hour. Like a trooper, Susanna rolled over and looked like she was filled with regret with her decision to humor me and join in on the fishing trip. I’ve fished with Matt a few times before, twice for musky and once for stripers (yikes, I just realized I never wrote about that trip! 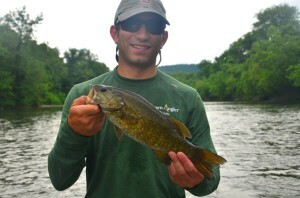 ), but this would be the first time getting out with him to focus on smallmouth. We rolled up about two minutes early with Matt waiting patiently and strung up our gear. Matt’s dad ran the shuttle with us, saving us an extra trip by car on each side. Matt told me and Susanna that we would be fishing topwater today – but I already knew that. Who would possibly fish any other way in late August? We got onto the water, and it was time for Susanna to demo her casting skills. Being a novice as-is, this was her first time casting in about two years, and the rust was really showing. Matt was prepared though. After a five minutes of casting lessons, she already was casting better than I had ever seen before. With everyone’s casts in check, we began the real float. The first stretch would be slow. For some reason, it seems every single float I’ve ever done is terrible through the first and last half mile of river. We get along some shoreline grass, and Matt tells me to be ready for a fish cruising the grass line. Sure enough, I get nailed by a 12-14” smallie. The skunk was off. The next fish slurped the fly like a trout taking in a midge. It barely even left a surface riffle. It was a true sign of a giant. Sure enough, my 7-weight bent hard. We battled back and forth, and I struggled keeping it out of the submerged grass. Matt gave me pointers on properly fighting the bronzeback. 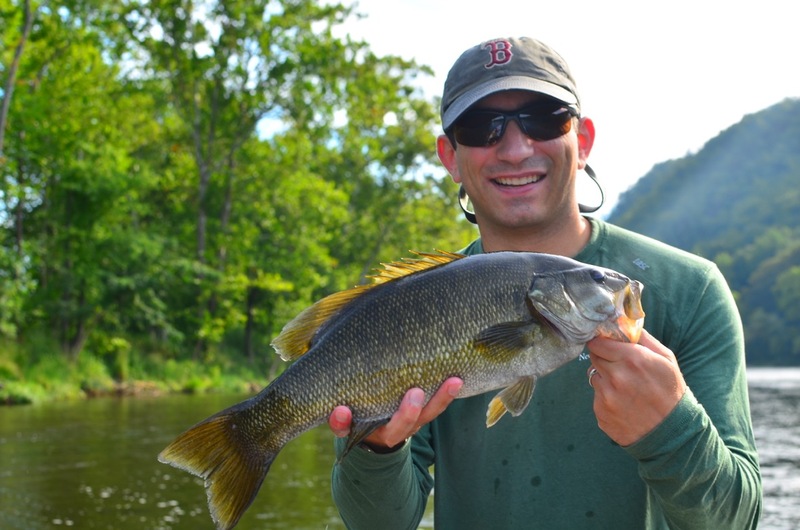 Go figure, after 15+ years of chasing smallies on the fly, you can still learn the right way to fish and fight fish. Matt netted my quarry. It measured just over 20 inches – a Virginia citation fish. Ready to book with Matt Miles? 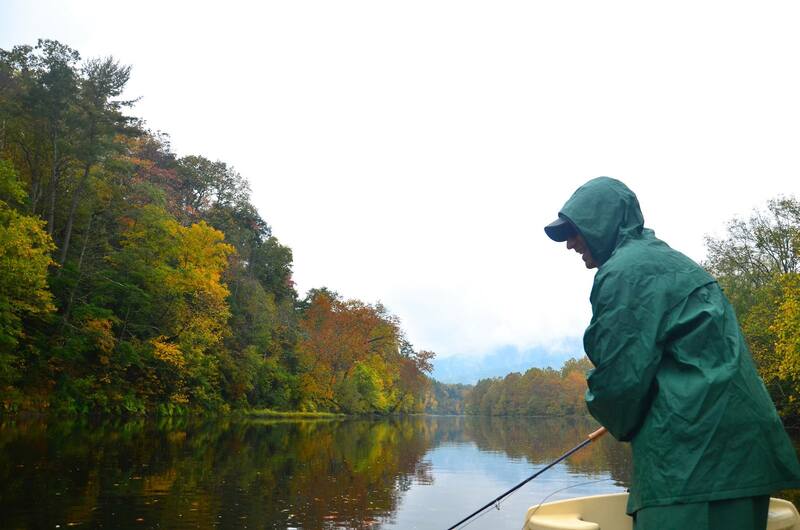 For some of the best fly fishing in southwest Virginia, give Matt a call. Rates start at $300 for a half day float or wade trip. I have my flaws – too many to list here, in fact. But the one that gets me is I get obsessed about things. Fishing, obviously, is one of them. Musky happened to be a sub-obsession. 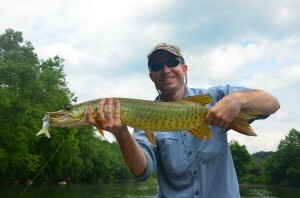 With the weather getting cooler, the musky fishing was picking back up here in Virginia. You might remember from an earlier blog post, my friend Joe and I went after some musky on the fly with Matt Miles Fly Fishing. Joe caught one and had another strike. I got nothing more than a single follow and a tired arm. I felt shunned by the fish. Why didn’t he eat my fly? Mine must have looked just as tasty. I had to have my revenge. With fall starting to hit full swing, Joe and I set up trip number 2 with Matt Miles on the James River. The weather was crap. Cool and overcast all day. A couple hours of rain in the morning, then misty and a shower or two the rest of the day. It was one of those days where the weather was only good for sipping some bourbon by the fire. And musky fishing. Matt was determined to put me on my first musky. We hit a different section of the James this time than we did last time. We launched and found the first fish right at the ramp. It swam off as we floated over it, but still made a few throws. I got the follow a couple times, but no strike. Maybe the next hole would be better. Matt taught us a trick cast, and how to throw a single hand rod with two hands. It was great. I was effortlessly throwing the half a chicken worth of feathers 80-feet plus all day without getting tired. This came in great use working more water with each cast. It turned out, this wasn’t going to be my trip to get revenge. Instead, the fish just laughed at me. Joe and I combined for over 14 follows the whole day, but we couldn’t coax a strike out of even one of these beasts. We saw some real tanks too – probably some that were close to 50 inches. Even though we never bent a rod on a fish, it was one of the more exciting days I’ve had of fishing. There’s nothing like watching a giant torpedo follow in your fly, then circle around with your figure 8, just contemplating whether it should pounce. The fish of 10,000 casts is beginning to live up to it’s name for me. I’ll be back out there soon, and hopefully I’ll get one to cooperate. In the meantime, look up Matt Miles and see if you can beat me to the punch and get one of these bad boys to eat your feathers. After you go, come back and tell us about it, then leave Matt a review! 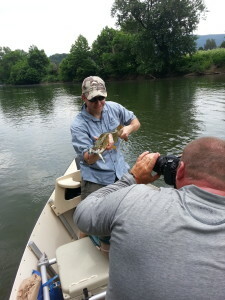 All pictures are courtesy of Matt Miles Fly Fishing. 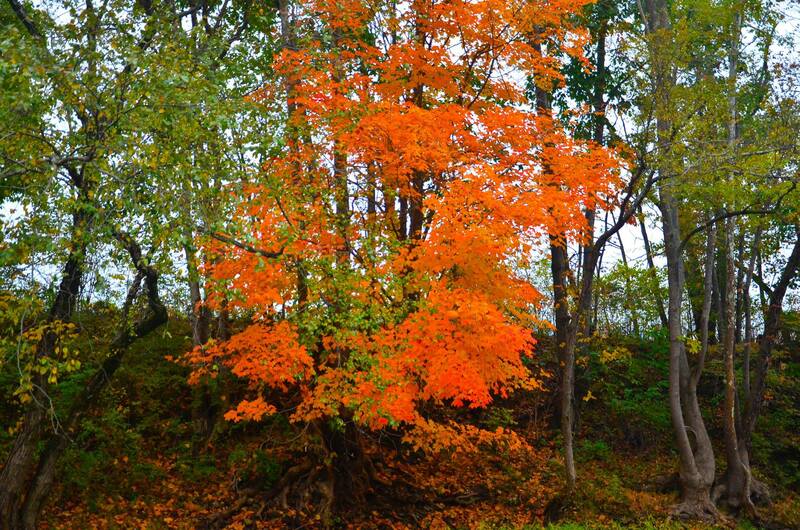 A brilliant tree on the James River. 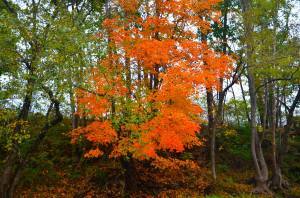 The foliage was beginning to turn on the James. Made for some nice scenery. 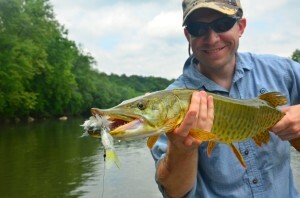 I’ve long known about the musky populations in Virginia rivers such as the New, James, and Shenandoah. Going after them has always been a fleeting thought in my head, but never made an honest effort to try to catch one. That all changed after a post on the message board of my local fly fishing club, Tidal Potomac Fly Rodders, with a picture of one of these beast’s toothy grin caught on a trip with Matt Miles – who I’ve dubbed the King of Musky Fly Fishing – of Matt Miles Fly Fishing. The wheels started turning. At a Tidal Potomac “Beer Tie” (a beer tie is an excuse for a bunch of guys to drink beer while tying flies and trading fish stories and lies), I met Joe and the musky idea came up. It was all but a done deal after that, and we were on our way to try to catch the fish of 10,000 casts. Our first attempt at going out with Matt was postponed due to a massive rainstorm completely blowing out the James River. Early June brought around our second attempt. This time, a rain storm added a little bit of flow and quite a bit of color, but not too much to call it off for a second time. Our 6:30 AM meeting put us on the river around 7 AM. 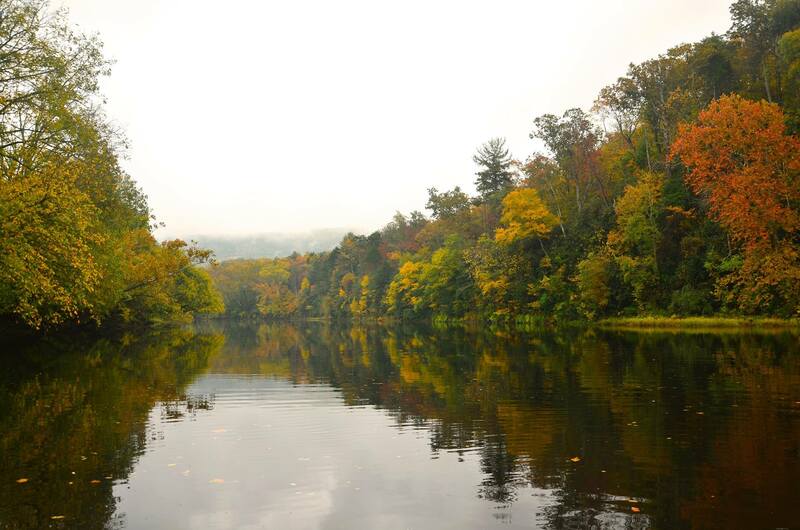 We’d be targeting musky, but throwing some smallmouth flies in between musky holes. Matt likes to throw big flies for musky. I don’t mean “big” like 4 inch deceivers. I mean BIG. The flies look like they’re the product of a weird science project to combine a full size chicken and squirrel. We’re talking 10, 12, or even 14 inch flies. Throwing a wet sock is no easy task. Minimizing your false casts and double hauling is a requirement to having a chance of throwing this 11 weight all day. Matt likes to throw big flies for musky. I don’t mean “big” like 4 inch deceivers. I mean BIG. The flies look like they’re the product of a weird science project to combine a full size chicken and squirrel. We’re talking 10, 12, or even 14 inch flies. Throwing a wet sock is no easy task. Minimizing your false casts and double hauling is a requirement to having a chance of throwing this 11 weight all day. If you learn to water-load, that will really help you late in the trip when you think your arm is about to fall off. My nice long casts from the early morning turned into mustering all my strength for a pitiful 30 foot cast by the last hole. Our day started off pretty slow. There were no musky to be seen. No strikes, no follows, nothing. You shouldn’t expect to see one every cast or every hole, but we were just getting blanked completely. To top it off, we couldn’t even muster a strike or follow from a smallmouths between musky holes. We were starting to get suspicious if fish actually lived in the James at all. Matt changed up my fly to a Tequilly and that woke up the smallies. This section of the James is still recovering from a fish kill and a few poor spawns, so most of the smallmouth were pretty small. That was OK, though, because this river isn’t a place we would have gone to target the smallies. Even still, I ended up with a couple decent size fish that are an absolute blast on the fly rod. Joe wasn’t having quite the same luck and was quick to blame me for stealing all the good holes from the front of the drift boat. We stopped for a stream-side picnic lunch before picking back up to try to find that elusive Musky. Joe took over the front of the boat (no more excuses from him now!) and we started slinging our water-logged birds. We approached a hole that Matt said was ripe with potential. Joe just about had his fly in the boat when I hear “MUSKY!!! !” and see Joe’s rod doubled over with an angry torpedo taking flight. It must have been his 10,000th cast. The musky tried its best to escape, but was no match for the 11 wt Helios 2. Joe subdued the fish and Matt scooped it up. It was officially the first Musky either of us had ever caught, and the first one I had even seen in person. At about 33 inches, it wasn’t the biggest fish in the river, but was no baby either. Matt whipped out his camera and snapped a few pictures. As you can tell from the photos, Matt definitely has some photography skills as well as fishing skills. Matt got the fish back in the water and release him to fight another day. About 10 minutes later, we pull up to another hole. Matt points out some fishy water, and Joe tosses his fly towards the spot. BOOM! An enormous musky hits his fly. This fish had to have been at least 50 inches. Unfortunately, the hook point didn’t find its way home and the best view we got was the flash of the fish. Joe and I each got one more follow, but couldn’t coax either fish to eat. By the end of our long day, Joe and I were both exhausted. I’ve never wanted to stop fishing before – and this wasn’t didn’t become the first time – but I just could make another cast to save my life. For a unique fly fishing experience, be sure to call up Matt. Central and Southwest Virginia has some fantastic fishing, and this definitely needs to be on your bucket list. 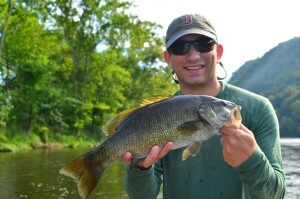 Matt guides year round for smallmouth and trout, and recommends September through June for Musky. I’m already starting to make plans to get back out there with him this fall. Rates start at $275 for a half day and $375 for a full day. Book a trip with Matt and come back and leave a review! Check out a short GoPro-filmed version of the trip on YouTube.